The Smithtown Fire Department rescued a few cats from trees, but never a kitten stuck in the suspension of a car. 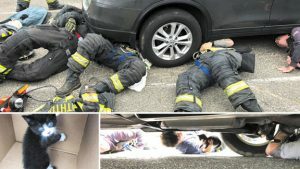 Our brave heroes responded to Hollywood Drive and Rescue 9 and Engine 5, instead of climbing a ladder, got on their hands and knees to extract the little guy from his hiding place. The mission was a success and had a happy ending. The vehicle owner adopted the cat on the spot!